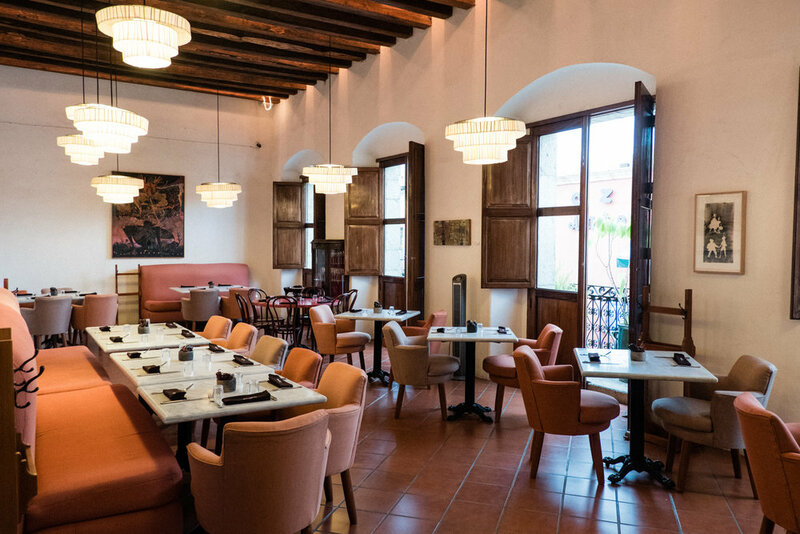 The restaurant and interiors are rustic, inviting and refined. Designed by local prominent (and might I add enormously charismatic, generous, lively and beloved by all who meet him) architect Guillermo De la Cajiga. Much of Oaxaca's historic charm is preserved within spaces that have been remodeled or repurposed, maintaining original architectural elements. Here, columns frame a communal table in Origen's first floor. When was the last time you were moved to tears by a work of art, a piece of music, a film, a book or a story? Being the Art History nerd that I am, I remember standing a couple of feet from Sandro Botticelli’s Birth of Venus in Florence, and being moved to tears. I know I’ve been to the Symphony a number of times where a dainty little handkerchief would have come in handy. And anyone who hasn’t ugly-cried from watching The Notebook or Up… well, yikes! Is that possible with an extraordinary meal or a perfectly balanced mouthful? I’m not one to easily cry, although I reluctantly admit I’m increasingly becoming a softie with age. Tearing up with commercials, that's how you know. How can you NOT increase in empathy from accumulating life? The odd thing is, as much as I’m impassioned by all things culinary, and despite several memorable occasions where I’ve been left speechless or had my eyes roll back in taste-bud rapture... crying, over food? Get a grip my friend, that’s just silly. Or… is it? From the start, my expectations were unreasonably high. I'd visited Oaxaca as a teenager, and even before discovering my own love of food, the city left a mark in me. Fast forward to too many years later, the moment arrived where I had to unquestionably follow my inner voice to impulsively move down there for a few months. Plus, as the Chef’s Table fanatic that I am, let’s be real and confess that Enrique Olivera’s episode had something to do with my whim, too. Tunas / Prickly Pears / Cactus Fruit. Seen everywhere in local markets, and the main ingredient for the bright fuchsia-colored sorbet seen in other photos here! In an upcoming post I'll feature a broader overview of Oaxaca and it's many delights, with tales of other incredible mouthfuls - from a little abuelita’s quaint secret kitchen on an unassuming block in the Centro, where tacos and tlayudas fry at night as soap operas play in the background of her wall-mounted flat screen tv in her modest abode (priorities people! )… to the array of chic avant-guard restaurants, to vendors abundant in the colorful plazas and street corners... and of course, open-air markets with all their intoxicating smells; from fresh chocolate being milled to smoke rising from stone comals where local women heat up freshly made tortillas, quesadillas, memelas or some variation of a corn base layered with all sorts of goodness. I ate like a queen and like a peasant, most of it magnificently satisfying in equal degree. By the end of four months, I’d heedlessly indulged in so much dining and mezcal-ing, that I developed a persistent case of silent heartburn (I know, that sounds like an oxymoron. Google: Laryngeal-Pharyngeal Reflux). Alas, a small price to pay for an exploration that ultimately led to... wait for it..... tears, yes, by way of food. 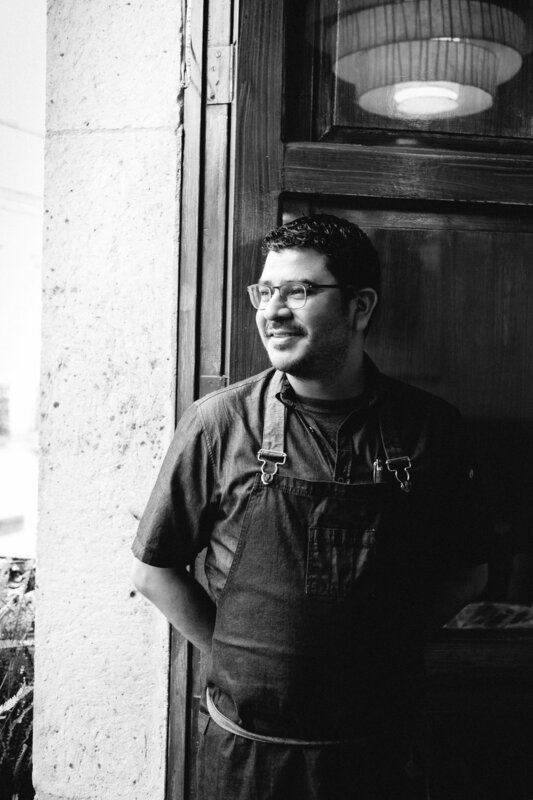 That brings us to the place and person responsible for said teary-eyed culinary experience: ORIGEN - chef and owner Rodolfo Castellano's (above) authentic yet elevated Oaxacan cuisine haven. With the state's abundance of ingredients and culinary heritage, the slow food farm-to-table concept is nothing new here. That's simply the way it is. Origen's menu naturally reflects the region and season. Aside from frequenting the local markets since childhood with his mother, Rodolfo supports the work of local producers, farmers and fishermen. This ethos doesn't come from sustainability and food ethics being "on trend". Oaxaca is a place that has managed to remain rooted within its rich gastronomical history; it is a culture intertwined with sourcing food from abundant surroundings, with a culinary diversity that ranges through the state’s varied regions, each with their own culinary heritage: Mixteca, Costa, Istmo, Cañada, Papaloapan, Sierra Sur and Sierra Norte... all of which inspire and inform Rodolfo's cooking. Early dinner by the window that overlooks a small street near the main Zocalo, the main bustling public square surrounded by restaurants, vendors & historic buildings. When I interviewed Rodolfo, three things stood out: kindness, wisdom, and above all, humility. The 2016 Top Chef Mexico winner, studied at the Instituto Culinario de Mexico, in Puebla. He had an enviable advantage though, having learned from a very young age the fundamentals of one of the richest gastronomical cuisines in the world, from one of the best Oaxacan sources one could ask for: his own mother, a restauranteur herself. What I love about Rodolfo's journey is that, although he understandably felt a drive as a young chef to learn techniques abroad and experience different perspectives and flavors from Europe to San Francisco, he eventually returned to his homeland to bring his experience and talent back to his roots. I'd argue this is one of the things that makes Origen stand out, an unmatchable authentic foundation that he pretty much carries in his bones, combined with a fresh perspective. SORBETS: Tuna / Prickly Pear (front) & Pulque with Strawberry (rear). Special shout out to these two incredibly bright (in aesthetics and flavor) sorbets for two reasons: 1. I'm rarely terribly excited about sorbet options at the end of dessert menu lists, but opted to order a couple for the sake of some photo ops. Whoa! Thank the heavens I did. These were a revelation all on their own. 2. The lighter pink one in the back is made from Pulque, a light alcoholic Mexican drink made from the fermentation of juice of various agave plants, especially the maguey. Another outlet for fermentation experiments? I'm in! I kept going back and forth between spoonfuls of each, trying to find a winner. I vote for Rodolfo Castellanos to open an ice cream joint as a side project. In the meantime, dusty ice cream machine, you're coming out of my bottom pantry shelf! Table centerpieces. Idea for your next Mexican dinner gathering! The first bites were immediately bright and fresh and perfectly balanced. 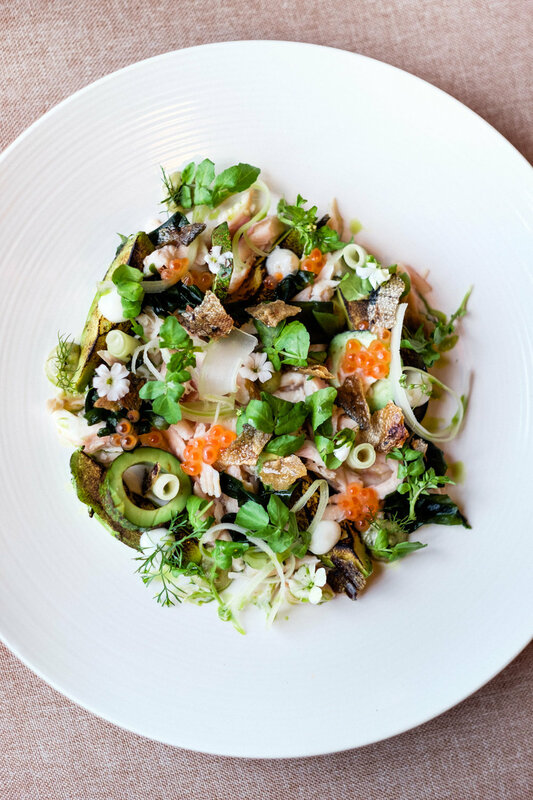 A tostada of wild mushrooms from the nearby sierras; a smoked trout salad with heirloom avocado; roasted spaghetti squash with local wild greens and aged goat's cheese. I ordered the fresh catch of the day served as I was draw to it being served with a traditional Oaxacan coloradito mole. I'll get into more details below with each photo, to not delay the ultimate culmination of this meal: dessert. Pesca del dia en mole coloradito, arroz, frijol blanco y platano macho // Catch of the day, coloradito mole, rice, canellini beans and plantain. See caption below for a more detailed description of the mole. Coloradito Mole is one of the famed moles of Oaxaca. It has a burnt red color and robust aroma, and as with most moles, it is made with a varied combination of spices and ingredients. Coloradito Mole in particular is typically made with Chilcostle chili (meaning yellow chili in the indigenous Náhuatl language). Here also topped with tiny dried shrimp, which can bee seen as pink mounds brimming over burlap sacs, with an intense, briny aroma, in markets all over Oaxaca. Often used as a flavor enhancer that adds notes of saltiness. I'd heard they were known for their "Chocolate and pasilla chili fondant truffles". Internally my gut reaction was to rebel against it. Chocolate truffles, and chili. Been there, done that. But ok. Chocolate any which way, twist my arm. Dessert came, and then... tears. Wait what? Yes people, tears. I don’t know exactly what did it, whether it was the dessert itself, the perfectly warm, spiced truffles against the bright lemon verbena ice cream and nature’s sweet gift of guanabana to balance... or whether it was simply a exquisite culmination of the quiet beautiful tension had been building throughout the meal, each dish feeling even better than the one before it. 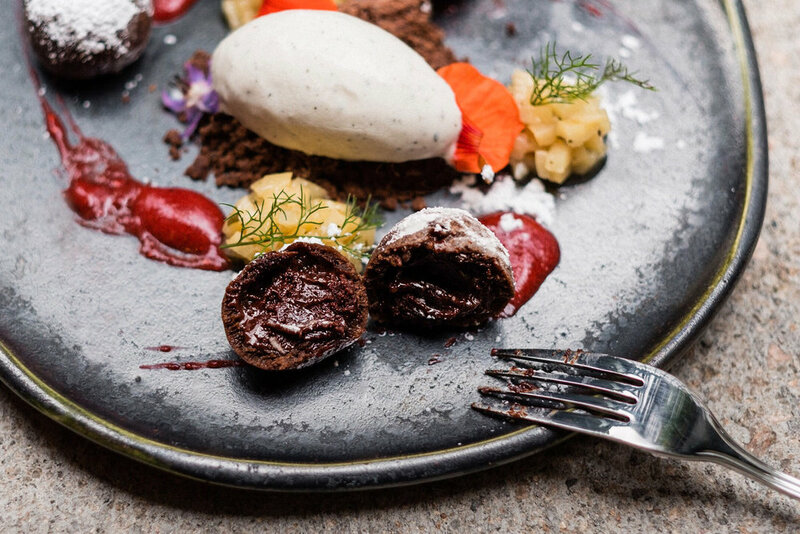 Chocolate and pasilla chili fondant truffles, lemon verbena ice cream, and guanabana. My mother, who’d come to visit upon my suggestion to gorge ourselves for a week at the city’s best restaurants, felt it too. I’ll put it this way: She’s never been thrilled about the times I’ve worked in a kitchen. I don’t altogether agree, her main concern reasonably as a mother is: "how are you going to meet someone when you’re tucked away in a kitchen 10 hours a day, 6 days a week!" Well, turns out she was 100% on board with me tucking myself away in this particular kitchen. As if bewitched by some mystical oaxacan culinary magic, I turned to her assertively: "I NEED to figure out what’s happening behind these kitchen doors". Since craigslist or culinaryagents is not a thing down here, I proceeded to shamelessly waive down our waiter, asking "how does one find out about job openings currently at the restaurant?" Throughout the late summer months, stormy rainy season in Oaxaca often paints the sky with dramatic dark blue and charcoal backdrops, creating a heightened effect where the already brightly colorful facades of the historic streets glow. A few days later, there I was, updating my culinary resume. Determined. But alas, life had other plans. Suddenly offered an opportunity for a food brand marketing project back home, back north I went! Along with 5 suitcases of dried spices, chilis, rustic earthenware of all sorts, local fabrics, etc etc. Although the lure of Oaxaca won’t keep me away for long, I'm currently enjoying happily brushing my teeth with tap water again. Q: What are some of the most important things to you? Rodolfo: Finding a balance between the restaurant and family. And that extends to the restaurant as well.. Origen itself is like a big family, and acknowledging that Origen is a team effort is important. If diners come and I'm not in the kitchen, the experience should be the same regardless. Q: What are your priorities as a Chef, what do you envision? R: Most of all I'm driven by the desire to have people enjoy themselves when they dine here. As a chef I've gone through many stages in my career. When you're young you have certain... aspirations... At this stage I'm not seeking fame, or to be the best restaurant. Of course I want it to be known that we are here, that the restaurant exists, but the main goal is to have people enjoy the food; and simply to have a great experience when they come. Q: Any new projects on the horizon? R: We're currently working on opening up a second restaurant in the Reforma neighborhood. It's a little more casual, bistro style, with more international offerings, and less specifically Oaxacan food. If all goes as planned, "Fiero" should be open sometime towards the end of the year. Q: What's one piece of advice you'd give to young aspiring chefs? R: Be prepared to work hard. The kitchen on the second floor. Cooks hard at work as they prepared for one of Oaxaca's many culinary festivities: Festival El Saber Del Sabor. A large table on the first floor where the team is gathered fresh ingredients in preparation for the Festival Saber del Sabor. 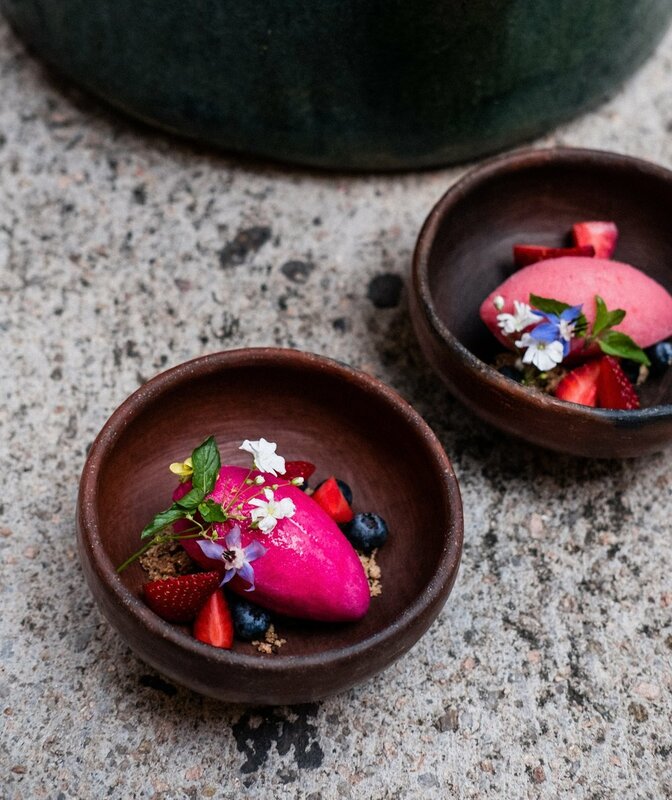 This year in particular, the festival brought a lot of renown restaurants and chefs together, to help raise funds for the many devasatating effects of recent earthquakes in Mexico. More of Oaxaca to come - stay tuned!